A Yo bike plus rider disappearing into Bristol docks. So mobike comes to an end in Manchester, apparently it'll be back but the coverage will basically be the city centre, won't even run as far as the uni on the flagship cycle route. Seems a bit pointless. There are also now Ofo bikes in London which are yellow/black. The scheme is apparently with the blessing of Hackney and Islington councils. Oxford has yellow Ofo bikes, teal Pony bikes and grey/orange Mobikes (which look extra funky with mag single sided wheels). Apparently there are also oBikes, but I don't think I've seen any them about the place. There was also a docked bike scheme, but I think that one failed. Seeing more and more Ofos and Mobikes around inner London every week. Plenty of Mobikes down here @ salford quays but then they seem scattered throughout the Salford area. I keep seeing ofos in the canal near Meadowhall in Sheffield, is there a word that means "funny sad"? I noticed today that something called 'Urbo' has arrived in Ipswich. Green and silver, fwiw. I was watching the Irwell having MoBikes retrieved from it in Salford recently. I was told that the scrotes would snap the sidestand off the bike and use it to batter the lock off. When they got bored of riding around at 4 - 6 mph they would repurpose the bike into a watercraft or art installation (depends whether it floated) by throwing it into one of several water courses spread liberally about the city centre. The minority win again. I doubt I would ever have used the scheme but it would have been nice to have it on the city's CV. There seem to be more knocking around London and I have seen the occasional one in what looks like legitimate use (as opposed to estate monkeys bombing between crime scenes as a prelude to it ending up mangled on a street corner or in a canal). It still to be a minority in legitimate use which, as business models go, isn't the most effective. Still, post-Brexit we might be able to eat them. The bikes, not the estate kids. When The Desperate Times come, the estate kids will probably eat us. This week, I've just started seeing these Lime E-bikes around the place in That London - dockless hire bikes in the mould of Mobike/Ofo but with electric assist. Interesting. Coincidentally, I've been pondering recently whether the Santander hire bikes should go electric. It would make a lot of sense for users, and the docking stations could act as charging points. On the other hand, I imagine the costs involved in converting the bikes and docking stations would be phenomenal. Has anyone tried one yet? I'm minded to give them a go, just to see what they're like. Well they're not relying on GPS alone. They've also got contact details and credit card authorisation for the person who last used the bike, so if a bike disappears they can get someone to un-disappear or pay for it. I expect vandalism is a greater concern. I'm minded to give them a go, just to see what they're like. Easily hired e-bikes should be a great way to get more people trying them (and hopefully discovering that they're a really practical form of transport). To unlock the bike, you scan a QR code. They've been in Brent around a month. Pretty pricy at £2 to unlock + 15p/min. I don't think they're getting many takers. The GPS isn't going to be much use once it's taken out of the bike, which is presumably no harder than with any other dockless (or even docking) hire bike. But I'd have thought collecting them all in for recharging is the biggest logistical problem. Presumably they'll have some sort of van which they can charge them in while they ferry them to wherever. That doesn't compare favourably to London bus fares, does it? It doesn't even compare favourably to Birmingham bus fares, TBH. Tourists would use it, of course, but Brent isn't ideal in that respect. I'm sure you'll get plenty of people 'having a go' simply because they're novel, but I reckon that's more likely to send them to the e-bike shop than create regular users. I assume someone rocks up in a van, removes the bat flattery and slides in a fully charged one, leaving the bike where it is unless it needs repairing or re-locating to somewhere less stupid. The great thing about e-bikes (and electric motor scooters, for that matter) is that the batteries are small enough to do that with. Which I believe are a thing in ABROAD, where the FOREIGNS have less restrictive licencing requirements for users of low-power motorcycles. A portion of the Paris Velibs are electric now. They had to rebuild all of the docking stations to make it happen though. There's no appetite in London to spend more money on the Santander scheme - it's expensive for the number of journeys taken. As far as I know the Lime model depends on making their money back before the bike is disappeared. Or not making their money back and filling in the gap with endless venture capital. 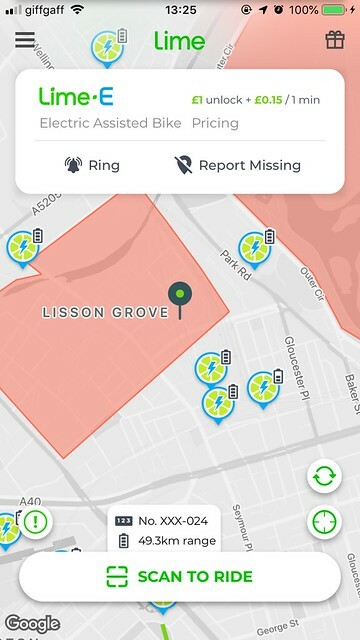 In other countries Lime manage to run a business renting much more disappearable electric micro scooters (which are illegal to use on the street here) rather than bikes, apparently at not-enough-of-a-loss to have gone out of business yet. I assume someone rocks up in a van, removes the bat flattery and slides in a fully charged one, leaving the bike where it is. The great thing about e-bikes (and electric motor scooters, for that matter) is that the batteries are small enough to do that with. Yes, that would make sense. Assuming they find more than a gps chip on the ground, of course! Electric motor scooters are very much a thing here too, although not so much as electric kick-along scooters, which of course you don't kick along. I suspect most users regard them as more convenient e-bikes, so no licence. Yes, I'm seeing a lot more of those non-kick scooters around (mostly on the pavement). They seem to appeal to the yoof who don't quite have the nerve for electric skateboards, but I've seen a couple being used by what you'd normally consider to be the mobility scooter demographic.